The Institute for Reporters' Freedom and Safety (IRFS) condemns the fact that the Supreme Court of Azerbaijan has failed to release the journalist and human rights defender Mehman Huseynov, and instead referred his case the Court of Appeal. The organisation reiterates its call for the withdrawal of all the charges against Mehman Huseynov and for his immediate release. It is regrettable, that, on 29 September, instead of completely terminating the criminal proceedings because of the absence of corpus delicti in the case, the judges of the highest court instance decided to partially revoke the decision of the Court of Appeal, obliging it toreconsider the journalist's case. "It is obvious that the decision of the Supreme Court has been taken under orders of the supreme executive power, which tries to keep the 'unwelcome' prominent journalist and human rights activist in prison for as long as possible," IRFS CEO Emin Huseynov said. "By referring the case back to the Court of Appeal, the authorities also intentionally protract Mehman Huseynov's case in order to delay the possibility of applying to the European Court of Human Rights. The authorities used the same delaying tactics in the case of another prominent prisoner of conscience, opposition presidential candidate from Republican Alternative Movement Ilgar Mammadov. The responsibility for the fate of Mehman Huseynov lies personally on President Ilham Aliyev, who gave the order for his politically motivated arrest. Based on the current reality, it is Ilham Aliyev who should show political will and take actions aimed at the release of his vocal critic," Emin Huseynov concluded. 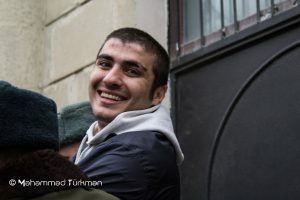 IRFS once again underlines that instead of accusing Mehman Huseynov of defamation against the police who illegally abducted and tortured him on 9 January 2017, the authorities should have prosecuted the policemen who were involved in the orchestrated punitive action of intimidation of a well-known fighter against high-ranking corrupt officials, whom Mehman Huseynov is. IRFS states that impunity for violence against and politically motivated harassment of journalists in Azerbaijan continues to intensify. For example, last week, dozens of journalists were demonstratively dismissed from the ATV television channel after well-known journalist and TV host Turan Ibrahimov dared to speak on a live broadcast about corruption and persecution of an entrepreneur by high-ranking officials with the purpose of illegal takeover of his business. Another outrageous case of violence occurred yesterday, 1 October, when well-known freelance reporter Islam Shikhali was detained by the regional police and brutally beaten for attempting to cover a mass religious ceremony. IRFS is more seriously alarmed over the anticipated tightening by Azerbaijani authorities of online censorship, which is expected to happen after a meeting between the leadership of Azerbaijan and Secretary of the Security Council of Russia Nikolai Patrushev. At the meetings held last week in Baku, representatives of special services and high-ranking officials responsible for the development of information technologies both from the Russian and Azerbaijani sides participated and shared experiences and plans for joint restrictive and deterrent activities in the future. IRFS calls on the Azerbaijani authorities to stop all attacks on freedom of speech and immediately release journalists Mehman Huseynov, Afgan Mukhtarli, Seymur Hazi, Aziz Orujov, Nijat Aliyev, Araz Guliyev, Fikrat Ibishbayli, Afgan Sadigov, Elchin Ismayilli, Javid Shiraliyev, Mahbub Zulfugarli, Ziya Asadli and Arshad Ibrahimov, bloggers Rashad Ramazanov and Ilkin Rustemzade, writers Saday Shakarli and Tofig Hasanov, as well as graffiti activists Giyas Ibrahimov and Bayram Mammadov. IRFS calls on the most important Western partners of Azerbaijan, the United States and the European Union, to demonstrate a stronger principled stance in the protection of fundamental human rights and democracy in Azerbaijan and start to impose harsh sanctions against high-ranking Azerbaijani officials and members of their families who are directly or indirectly responsible for flagrant violations.